Some species of lizards are able to shed or lose their tails when trying to escape from a predator. This is called caudal autotomy. The tail can continue to move and distract the predator. The lizard can regrow the tail later but it will contain cartilage instead of bone and will often have a different skin color and texture. Although the lizard may have saved its life by losing its tail, it has also has lost a significant amount of energy and has lower social status until it regrows its tail. Toilet paper comes with lines of small cuts between the individual sheets, so it is easy to tear one off at pre-determined places. A lizard’s tail works in the same way according to Dr. Sanggaard and his colleagues in Denmark. The tails don’t break off at random places. Instead, they have sets of “score lines”, where the tissue on either side is loosely stuck together and can be easily separated. But it’s not that a biting predator just pulls it off. The lizard helps the process along by contracting its muscles, which is why it takes more force to break the tail of an unconscious or dead lizard. Typically, the animal jettisons the tail just above the place where it was grabbed. After all, a tail is useful for communication, balance, storing fat, and even aerobatics—it’s not a thing to be casually lost, and the lizard benefits by detaching as little as possible. Dr. Sanggaard noted that the inside and outside of the lizard’s tail appear to be organized in such a way as to maximize surface area. 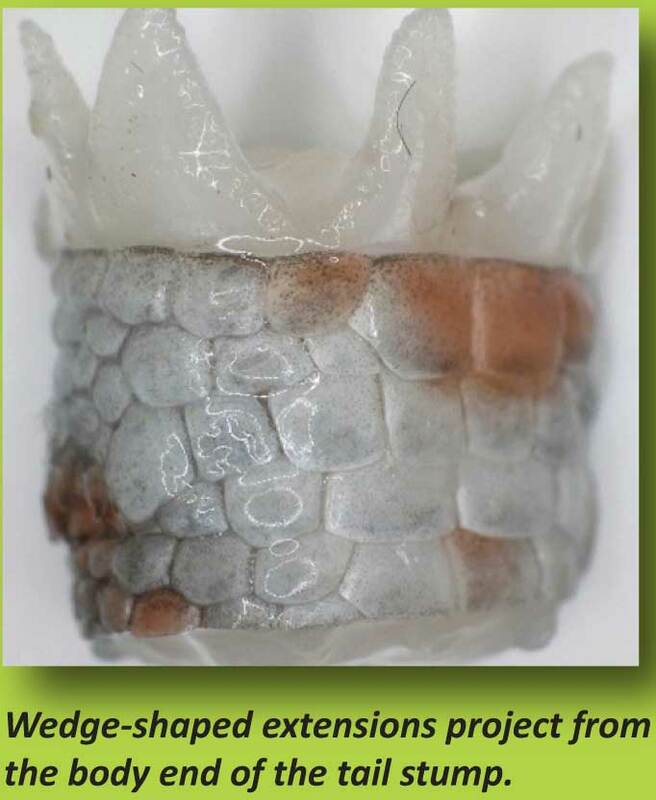 He proposes that friction and adhesion, similar to the mechanism by which the tiny “hairs” on gecko toes help them climb, are the primary forces holding the “precut” tail segments together. When a predator chomps down on the lizard’s tail, Dr. Sanggaard believes the lizard contracts muscles to disrupt the adhesive forces, dropping the tail. Mark a straight line across one sheet of paper. Poke the paper with the pushpin, making a hole every 1/4 inch across the line. Mark a straight line across the other paper. Pierce the paper with the pin every 1/8 inch across the line, marking sure the pin goes all the way through the paper. Time to compare: Carefully tear the first paper along the perforated line, noting how easily the paper tears. Carefully tear the second paper along the perforated line. Which paper tore more easily? What would happen if the holes were closer together? Further apart? Paper is essentially hundreds of fiber links that adhere the paper together. When you pierced the paper and made little holes, you broke some of those links. This reduced the adhesive forces that held the paper together and It took less energy to pull the paper apart. This is similar to how the contracting muscles of the lizard reduces the adhesive forces, enabling him to drop his tail. ← Why do buffalo roll in the dirt?